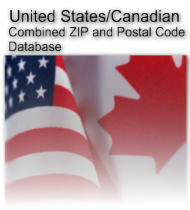 Advanced geocoded United States 5-digit ZIP and Canadian Postal Code data. This product contains all United States ZIP codes and Canadian postal codes in a single package. Contains over 800,000 records. Each record contains the ZIP or postal code, the preferred city or location name with state or province abbreviation and associated latitude and longitude coordinates. This package also includes full time zone information and primary telephone area code associated with each postal code. PostalCode VARCHAR(7) The five or six character post code. City VARCHAR(64) Name of city or location. Abbreviation VARCHAR(13) Standard USPS or Canada Post 13 character city name abbreviation. StateProvinceName VARCHAR(64) Full name of the state or province. StateProvince CHAR(2) Official abbreviation of the state or province. Country CHAR(2) ISO 3166 country code. PostalCodeType CHAR(1) The postal code definition or type for delivery purposes. AreaCode CHAR(3) Primary area code associated with the post code. Overlay VARCHAR (28) Additional telephone area codes in use when the predominate telephone area code is an overlayed area code. North American Time Zone the post code is located in. Determined using Coordinated Universal Time (UTC) offset also referred to as hours relative to GMT. DST CHAR(1) Daylight savings time recognized, (Y)es or (N)o.
UTC VARCHAR (28) Time zone the ZIP Code is located in specified as a Universal Time Coordinate offset. Latitude DOUBLE Latitude in decimal degrees to the center of the postal code. Longitude DOUBLE Longitude in decimal degrees to the center of the postal code.